Once upon a time in a land far, far away there was a girl. Her sister called her Ms. Granola. She was a camping, hiking, nature loving, roller skating, chocolate eating, always busy, never say “die”, stubborn- force- to -be- reckoned -with -sometimes-oddly -quiet kind of girl. She was 15. Her legs were too long for her pants and her shoes wore out before she did. She was an artist, daughter, sister, friend who became a soldier, wife, mother, lover, student, teacher, patient, grandmother, healer, and an Artist. When life was loud, she made art. When life was changing, she made art. When life was hard, she made art. When life was quiet, she made art. When life was Great, she made art. When the world went dark and her body gave out, she dreamed about making Art. Then, somebody gave her a camera. She opened her eyes and Faced the Phases of the Healing Process. In 2009, the pictures she took became the Sherman Street Garden Project. Slowly she began to bloom. She is Still Standing, Sometimes. I have decided to participate in Leah Piken Kolidas’ Art Every Day Month Challenge at Creative Every Day during the Month of November. 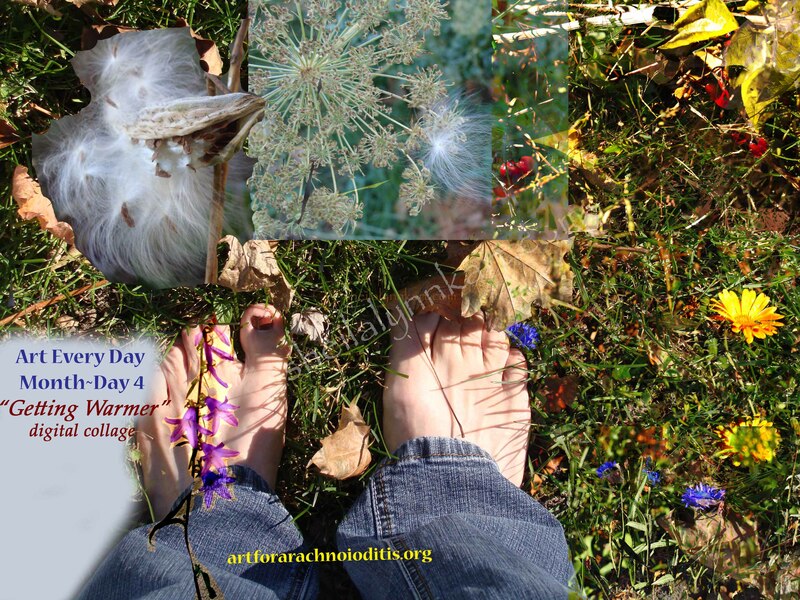 For the first time, as I do this 30 day challenge, I will be posting my progress HERE for arachnoiditis survivors and advocates.